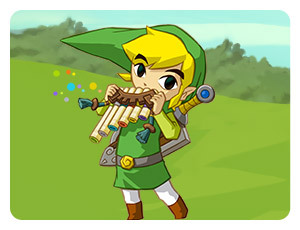 Musical instruments have played a big role in The Legend of Zelda series, whether it’s controlling the flow of time in Ocarina of Time and Majora’s Mask or controlling the forces of nature in The Wind Waker. Hell, way back before any of you were paying any attention to anything we did, we even wrote a handful of Bombers articles on the subject, including two wonderful pieces by our Finnish founding father Uncle Meat (remember him?) So, it’s not a big surprise that Spirit Tracks features musical elements as well. What are you playing this time? How do you play it? Step inside to find out. Yes, you’ll be able to use your DS microphone and stylus to help Link to play the Spirit Pipes in his new adventure. They’re basically like a set of pan pipes which you can play to summon special powers. To play them you blow into the DS microphone while cycling through different coloured pipes with the stylus. Before you’re able to visit a temple, you have to search for one of the land’s guardians, called the Lokomo, who will teach you a song which restores the tracks to the temple. You’ll then be required to listen to the metronome to keep to the rhythm. Sounds interesting to say the least. Also, this appears to shed even more light on the Lokomo. Apparently, they are the guardians of the land. Is that then just another name for a sage? Who knows, but I am sure we will find out more about them before the game hits. Spirit Tracks will be released on December 7th in the states, December 11th in Europe, and December 23rd in Japan.